This guide will work for any flight controller, F1, F3 or F4, like the Naze32, Flip32, SP Racing F3, Diatone D-Link F3, Holybro F3, Omnibus and etc. The telemetry data is an optional feature, but it’s really great! Using telemetry, you can send lots of information from model to the radio transmitter. For FPV Mini quads, usually only the battery voltage is used. To wire the receiver using SBUS, it’s necessary to use one of the Flight Controller serial ports (UART), and for telemetry, another serial port must be used. 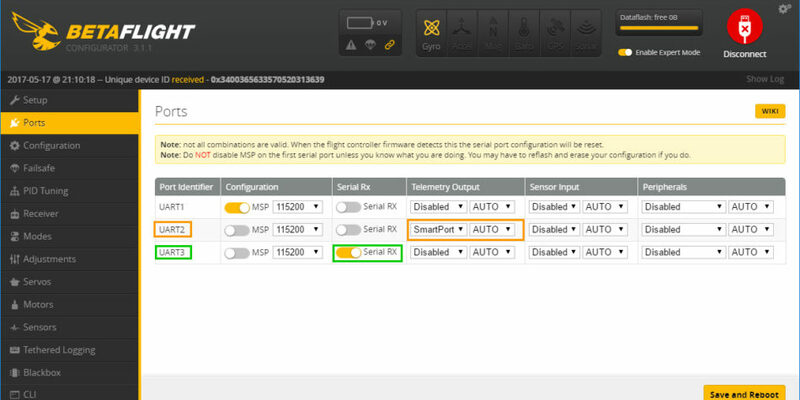 So if you want telemetry, you’ll need use two free serial ports on FC. Some FCs have the #1 serial port (UART1) shared with the USB port. For this kind of FC, you should not use the UART1 for receiver of for telemetry, because it’ll make impossible to use the USB port again (unless you reflash the FC). 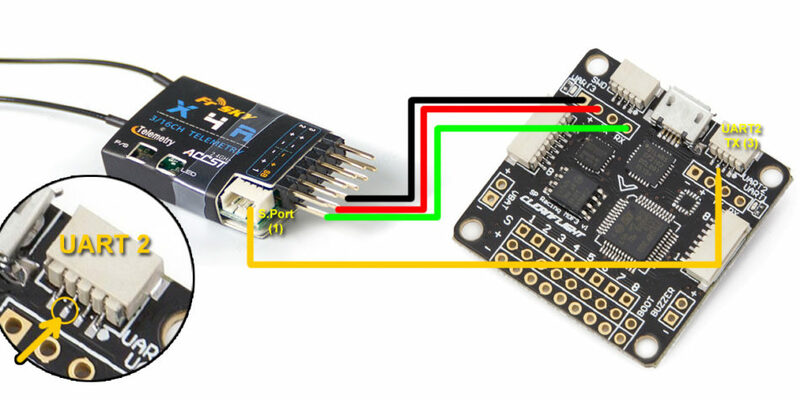 In this case, you can still use the UART2 and UART3 ports. If your Flight Controller have a F1 processor (Like CC3D or Naze32) you will have only two serial ports (UART1 and UART2), and UART1 will be in use by the USB port, so you’ll have only one free serial port (UART2), and will not be able to use the telemetry feature. This problem can be “partially workarounded” by using a software defined serial port (SOFTSERIAL). 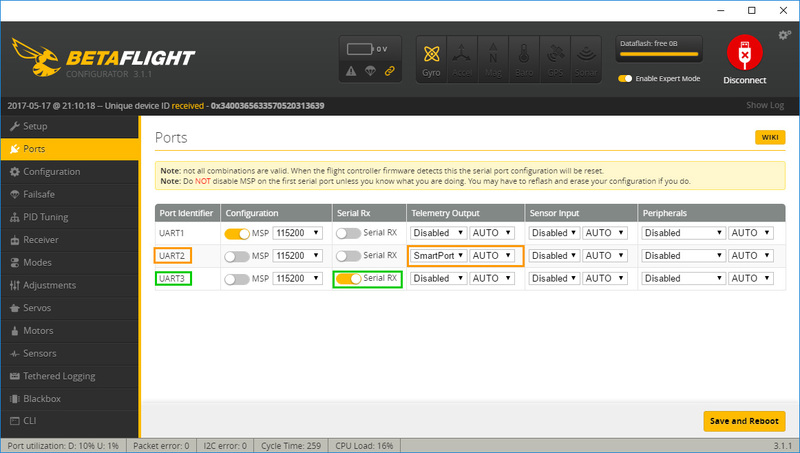 Check if your flight controller supports this feature in this case. Do you have any doubt? Leave a comment! hi, I brought a 2nd hand quad with the components described above. The FrSky X4R-SB is connected to the IO_2 connector ONLY. The 8 pin JST-SH cable pins 1/2/3 (black/red/white) 3 pin connector is plugged into the X4R-SB pins as detailed in your image above (black/red/green). The S.Port pin appears to be linked to both pin 7&8 (green and yellow) on the 8 pin JST-SH. Is this using a SOFTSERIAL port as described above or do I need to check that UART3 has serial Rx enabled?